UPDATED: Thu., March 29, 2018, 10:20 p.m.
COLUMBUS, Ohio – Notre Dame coach Muffet McGraw called this the toughest year of her Hall of Fame career. Having four players go down for the season with ACL injuries will do that. 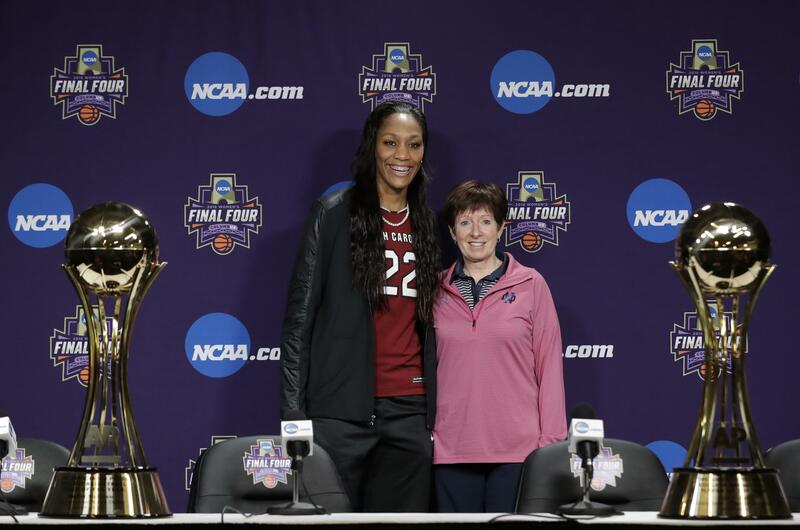 She still won the Associated Press women’s basketball Coach of the Year on Thursday after getting the Irish to a 33-3 record and the team’s first trip to the Final Four in three seasons. McGraw received 10 votes from the 32-member national media panel that votes for the weekly AP Top 25. Mississippi State coach Vic Schaefer also garnered 10 votes and McGraw won a runoff. “Vic had an incredible season as well,” McGraw said of the Bulldogs coach who guided his team to only one loss and the SEC regular-season crown. That loss came to South Carolina, which was led by AP Player of the Year A’ja Wilson. Wilson was the overwhelming choice, receiving 22 votes. UConn’s Katie Lou Samuelson was second with five. Kalani Brown of Baylor, Asia Durr of Louisville, Megan Gustafson of Iowa, Sabrina Ionescu of Oregon and Victoria Vivians of Mississippi State each received one vote. The South Carolina star, who is the first player from the school to win the AP award, is the consensus first pick in the upcoming WNBA draft. Wilson helped the Gamecocks to their first title last year and averaged 22.6 points and 11.8 rebounds for the team this season before the Gamecocks lost to UConn on Monday night in the Albany regional final. McGraw also won the award in 2001, 2013 and 2014. Only Connecticut’s Geno Auriemma has won the award more, doing it nine times since it was first introduced in 1995. Louisville’s Jeff Walz had five votes while Baylor’s Kim Mulkey got three. Auriemma and Oregon’s Kelly Graves each had two. Published: March 29, 2018, 3:43 p.m. Updated: March 29, 2018, 10:20 p.m.